A backhoe was on the track an Amtrak train was traveling prior to a collision in Chester, Delaware County, the NTSB said. CHESTER, Pa. (WPVI) -- The Medical Examiner's Office has released the names of the two people killed in an Amtrak crash in Chester, Delaware County Sunday morning. The victims are identified as 61-year-old Joseph Carter, Jr. of Wilmington, Delaware and 59-year-old Peter John Adamovich of Lincoln University, Pennsylvania. 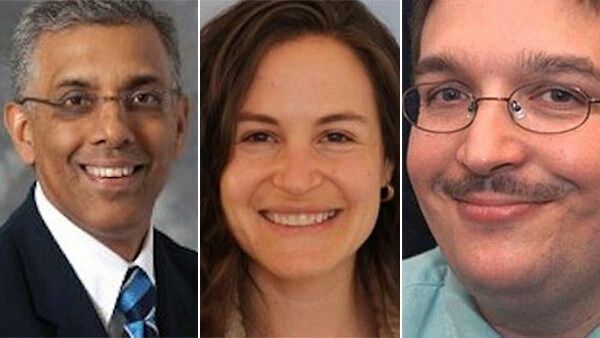 In the autopsy report, the medical examiner identifies Carter as the backhoe operator and Adamovich as a pedestrian. The ME describes both as a "worker struck by train." The cause of death was blunt force trauma; the manner of death was accidental. U.S. Sen. Chuck Schumer, D-N.Y., told reporters in New York he had spoken with Amtrak Board Chairman Anthony Coscia. He said both workers killed were Amtrak employees, the backhoe operator and the supervisor. During a Monday evening news conference, the NTSB said a backhoe was on the same track the Amtrak train was traveling prior to the collision in Chester. Ryan Frigo, the NTSB Investigator in Charge, said the forward-facing camera on the train recorded up to the collision. "The video showed there was construction equipment on the track and work train equipment on the track immediately adjacent to the Amtrak train's track," Frigo said. "The backhoe was on the track where the Amtrak train was traveling." Frigo described the work train equipment that was on the track next to the Amtrak train's track as a Loram ballast cleaner. Frigo says, however, he can't speculate if either the train or the backhoe were authorized to be on the track at the time on the crash. "We're still gathering facts on that information on who had the authority to be on that track," Frigo said. The NTSB says there have been no anomalies as it pertains to their examination of the locomotive and passenger cars, or in their inspection of maintenance records. Frigo also said the event recording data is of "good quality" and recorded up to the point of the collision. Event recorder from Amtrak Train 89 in NTSB lab in Washington. "The engineer placed the train into emergency approximately five seconds from the end of the recording. Speed at that time was 106 miles per hour and the track speed at that location is 110 miles per hour," Frigo said. The NTSB says the investigation will take months to complete. 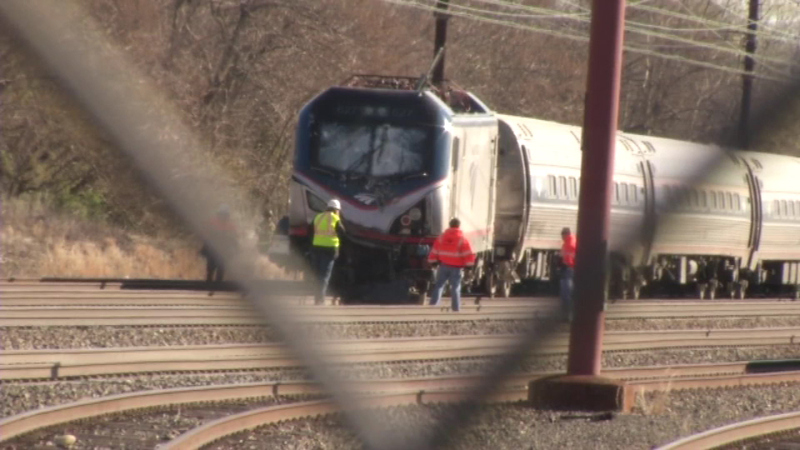 Amtrak and SEPTA resumed service on the Northeast Corridor, with some residual delays, a day after the fatal crash. The accident was first reported at 7:53 a.m. Sunday near Booth Street on the Palmetto Train 89. Frigo said the exact point of impact was at mile post 15.7, just north of the Booth Street underpass. The train was operating from New York to Savannah, Georgia. Investigators are working to determine what led to Sunday's deadly Amtrak crash in Chester, Pa.
Amtrak officials say the train struck a backhoe that was on the tracks and the impact derailed the lead engine of the train. Action News spoke with some panicked passengers as they were off-loading from the train. "Rapid deceleration, screaming and shouting. The car filled up with smoke, then we came to a stop," said David Nguyen of Washington, D.C.
"We hit something, and you could feel the impact," said Kamati Pinkston of New York City. "It was a big bang." Officials say 330 passengers and seven crew members were on board at the time of the accident. Of those 300 passengers, 30 were hospitalized for unknown injuries. A locomotive engineer was also hospitalized. Chester Fire Commissioner Travis Thomas said in a late Sunday morning press conference the scene extended to Trainer, Pa.
Linton Holmes of Wilson, North Carolina was in the back of the train when it derailed in Delaware County. Linton Holmes of Wilson, North Carolina was on the train when it derailed in Delaware County. "The train was rumbling. We got off track, I guess. It was just a bunch of dust. There was dust everywhere. "Then the train conductors, they were running to the front, because I was all the way in the back. Five more minutes, we were just waiting there. Then the train conductor came up and told us there was a fatality, and wanted to see if anyone else was injured," Holmes said. Holmes recalled an explosion of some kind. "It was an explosion. We got off track and then there was like a big explosion. Then there was a fire and windows burst out. Some people were cut up, but it was just minor injuries," Holmes said. Mariam Akhtar from Washington, D.C. was on the sixth car. "It felt like the train hit something, and there were like three or four really big bangs and it kind of threw us off the seats we were sitting in. 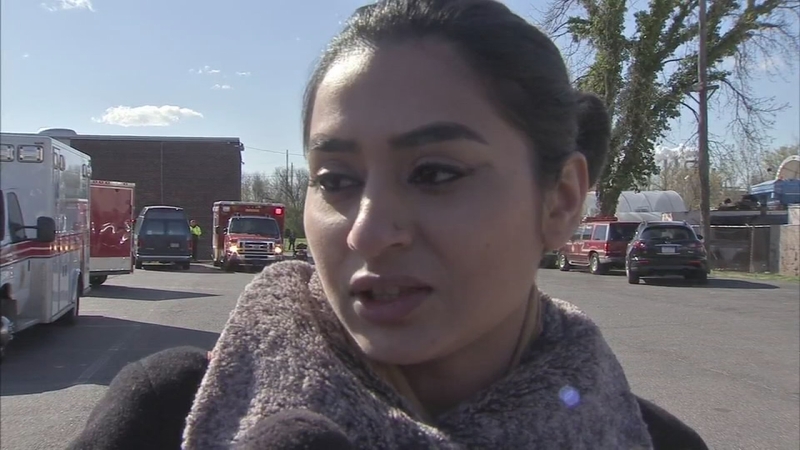 "There was a lot of smoke and everybody was yelling. The train kind of stopped and, later on, everybody was running to the front. Then the people who were in the front started walking toward the back," Akhtar said. Akhtar says the crew handled the situation well. She says she was on the train for about 30 minutes before she was able to exit. Action News also spoke with a man on the phone whose 52-year-old mother was on the train. He says she was on her way from New York City to her home in Maryland. His mother said she has injuries to her knees, head and back, but he was able to talk to her on the phone. She told him it was a scary and chaotic scene; she was stuck on the train for some time before being taken out in an ambulance. Action News has obtained scanner audio from first responders who were called to the scene shortly after the crash. 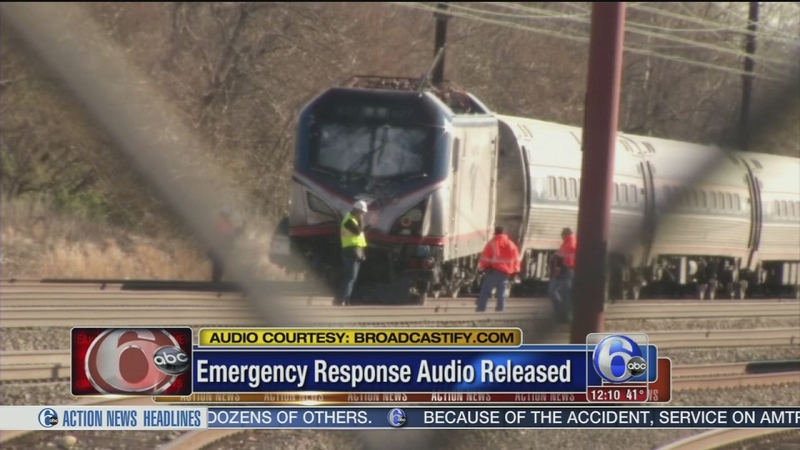 Action News has obtained scanner audio from first responders who were called to the scene shortly of the deadly Amtrak crash in Delaware County. Emergency crews on the scene aided the passengers at 9th and Langley in Trainer. Other passengers were directed to the rear hall of the Trainer United Methodist Church. Later, SEPTA buses were brought in to transport the passengers. All passengers were taken to Philadelphia. This incident comes almost a year after another fatal train accident. Back in May 2015, Amtrak Train 188 crashed in the Port Richmond section of Philadelphia and left eight people dead. We are deeply saddened by today's accident - the latest deadly tragedy along the Amtrak Northeast Corridor. While we greatly respect the investigative process and will not speculate as to cause, we do know that every safety protocol and practice must be closely examined to ensure passengers, crews, contractors, and the general public that our nation's passenger rail service is being operated as safely as possible. We at NARP were saddened to learn this morning of the derailment just south of Philadelphia that has claimed at least two lives and injured many more. As a former firefighter/medic, I can attest to how chaotic these kinds of incidents can be and to how any initial information that emerges is often incorrect or incomplete. While it is too early to know how this incident occurred, I'm sure investigators will do a thorough job to help all of us understand how this tragedy occurred and how future incidents might be prevented. 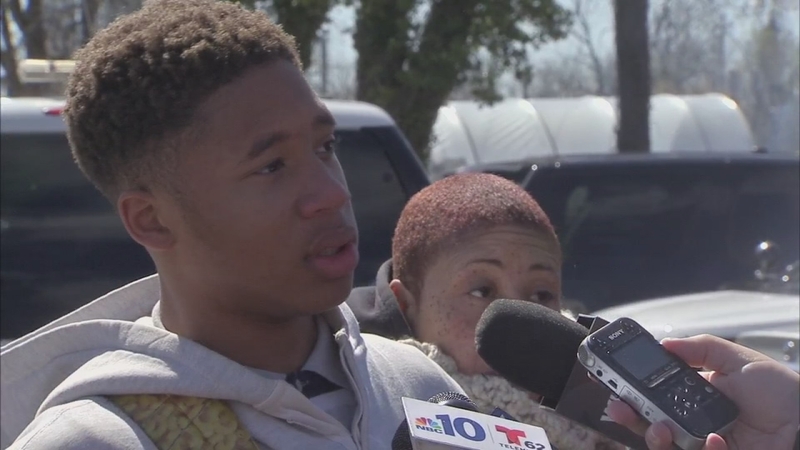 VIDEO: Passenger recalls Amtrak derailment in Chester, Pa.